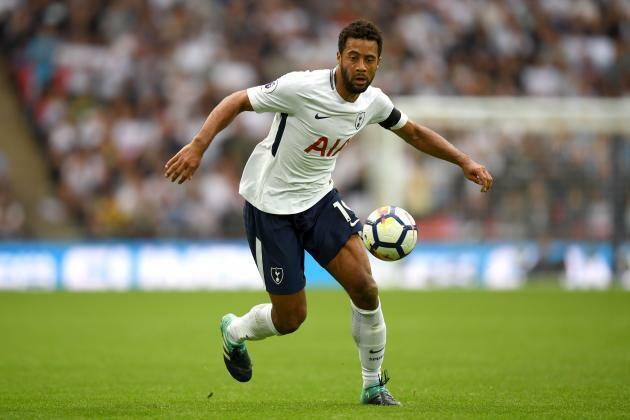 If reports are to be believed, it looks like Tottenham will allow Mousa Dembélé to leave in the summer. Dembélé’s relatively unique combination of defensive contribution, dribbling ability, and incisive short passing make him perfect for a central midfield role in a high-intensity pressing system. Nonetheless, he will turn 31 in July, and so not tying him down on a likely expensive 3-4 year deal is probably the smartest move for Tottenham to make here. It gives them a chance to bring a player approaching his peak in, rather than one getting further and further away from it. 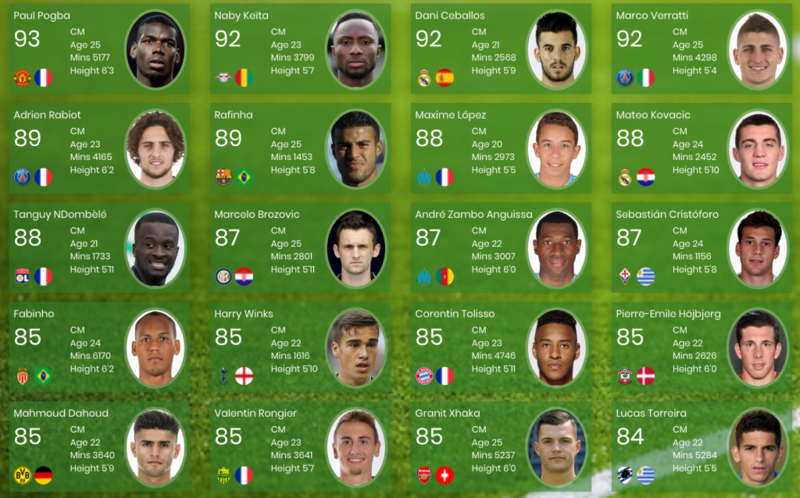 Using TransferLab, let’s construct a shortlist of players who might fit the bill. The parameters are clear: a centre-midfielder with dribbling ability, defensive contribution, and who is a confident short-passer, who is under 25. We’ll also restrict the search for players who play in one of Europe’s Big 5 competitions, or the Eredivisie which Tottenham often buy from, and to those who have played more than 750 minutes in the last two seasons. It is no surprise to see Paul Pogba and Naby Keita come up as the two highest ranked possibilities here. Both are uniquely gifted all-round central midfielders, the latter of which is moving to Liverpool in the summer, who are tactically similar to Tottenham in many ways. Dani Ceballos recently moved to Real Madrid, but has had little luck when it comes to playing time in Zidane’s team of Galacticos. One player surfaced by our search who most probably won’t have heard of yet but could be an ideal candidate is Tanguy NDombele of Olympique Lyon. 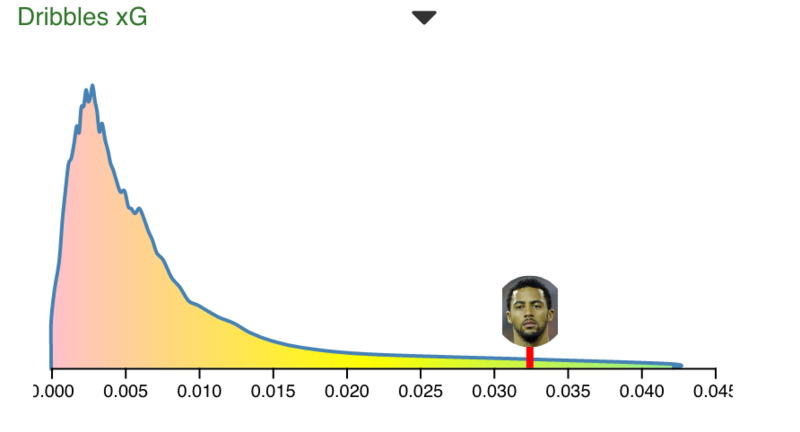 His overall profile is extremely similar to Dembélé’s, especially his dribbling which is his stand-out feature. At just 21, he is likely to be one that many big European clubs will be having a closer look at over the coming months. Another interesting finding here, though, is TransferLab’s highlighting of the potential for Tottenham to not replace Dembélé at all due to the possibility of Harry Winks stepping up and having a more prominent role. The Englishman dribbles slightly less, but has a greater passing range while being similarly involved in terms of defensive contribution. 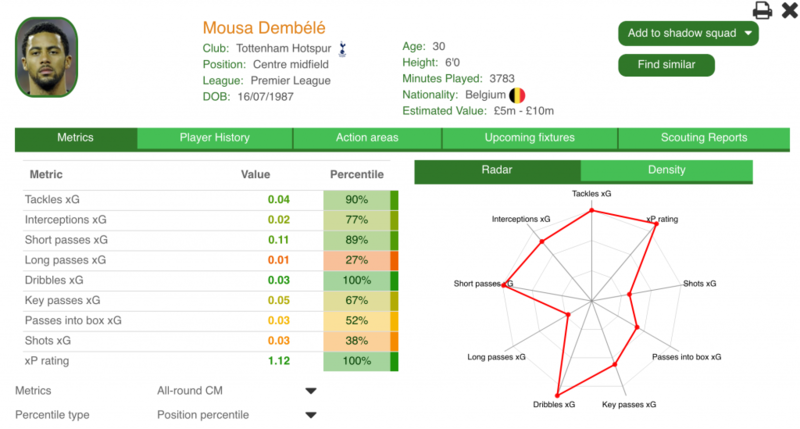 While it is likely that Tottenham will need an extra midfielder to flesh out their squad, it may be that the main aspects of Dembélé‘s “genius” that are so valuable to them could be replicated by Winks, allowing them to search for a central midfielder of a different profile. This exercise hopefully makes it clear how easily TransferLab can be used to generate a shortlist for a club’s scouts. Rather than prescribing uniform ratings, it allows each club to create their own profiles and search for players that meet their stylistic profile.